Science for kids - Exploring Forces with types and facts. Our life is full of forces. We cannot see these forces but we can see how they affect different things. Forces can change the shape of something, can change its speed, or change the direction that is it moving in. Forces are pushes or pulls. Can change the shape or size of an object. Can change the direction of a moving object. Can change the speed of moving things moving (can make things move faster or slower). Therefore forces can change the shape, speed or direction of things. Forces are measured in Newtons (N). We measure forces using a force meter (also known as a Newton meter). 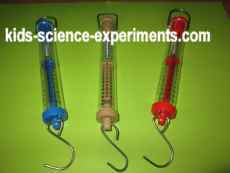 A Force meter is a piece of equipment containing a spring, used to measure forces. Newton meters have a spring on the inside which is stretched. The amount of the stretch in the spring depends on the size of the force. The units for measuring forces are Newtons (N). Newton (N) the unit of force. Remember that a Force is a push or a pull. Air resistance – is a force that tries to slow things down that are moving through air. It is a type of friction and sometimes called drag. Contact force – is a force that needs to touch an object before it can affect it (e.g. friction). Contact forces need to touch the thing that they are affecting. Examples of contact forces are: Friction, Air resistance, Water resistance and Upthrust. Many forces need to touch an object before they can affect it. These forces are called contact forces. When you throw a ball, you have to touch the ball to put a force on it. When you go down hill on a bicycle, the brakes need to touch the wheel to produce the force called friction so that you can slow down. Friction – is a force that tries to slow objects down when two objects rub against each other. Friction is a force that happens when two things rubbing together. Oil and grease can help reduce friction. By adding grease or oil to something it is called lubrication. Two objects touching have the force of friction between them. Heat and noise are produced by friction. Air resistance and water resistance are both types of friction. Skiers use a special wax to make the bottom of their skis very smooth. Rock climbing shoes are made from a special rubber which helps to increase friction and give a good grip. Gravity – is the force of attraction between any two objects. Our Earth is very big and therefore has strong gravity that pulls everything downwards towards the center of Earth. Gravity is any two objects that have a force of attraction between them. The weight of something is the amount of force in which gravity is pulling it down. 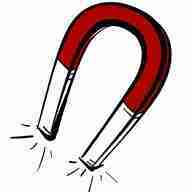 Magnetism – is a force that attracts objects made of iron - magnets have magnetism. Non-contact force – is a force that affects something from a distance like gravity. Some forces do not need to touch the things that they are affecting. Some forces can affect an object from a distance. This force is called non-contact forces. There are three non-contact forces - Magnetism, Gravity and Static Electricity. Speed – is how fast something is moving. Speed is a way of saying how far you travel in a certain time. Often measured in metres per second (m/s). Static electricity – is a force which attracts things with extra electrical charges on them. Static electricity can attract charged objects. Upthrust – is a force that pushes things up. Solid things, like your chair, give you upthrust. Things float in water because of upthrust. When you are standing on the ground, gravity is pulling you down. The upwards force from the ground stops you from sinking into the Earth - this upwards force is called upthrust. Water resistance – is a force that tries to slow things down that are moving through water. It is a type of friction and sometimes called drag. Floating - When you float in water, you feel so much lighter in weight. The reason is because the upthrust from the water is pushing up against your body weight. You still have weight, but you do not feel it. An object will float when the upthrust cancels out its weight. Forces can be large or small. Forces can work together or they can work against each other. Two forces work aginst each other if they are in opposite directions. If one of the forces is stronger than the other, the forces are unbalances and something will start to move. If two forces are the same in size, the forces are balanced and nothing will happen. All objects that are still or stationary items have balanced forces on them. Challenge yourself on the Force Quiz page to see what you know about forces!